By now, folks should be able to differentiate between the high-profile THIN LIZZY offshoot BLACK STAR RIDERS and Germany's oft-tagged "riffonauts", BLACK SPACE RIDERS. If celestial sludge is your speed, then the latter is for you. The 2010 self-titled album, along with "D:REI" and "Light is the New Dark" is mandatory listening. Yet following the breakout acclaim of 2015's "Refugeeum" and its experimental companion EP, "Beyond Refugeeum", BLACK SPACE RIDERS has of late been taking strides toward a more sophisticated sound. For 2018, this means a gross hijacking of classic alternative rock into the band's curiously evolving procedures. 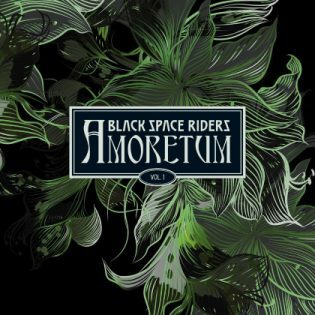 "Amoretum" is a hybrid word concocted by the band, merging "amor" and "arboretum", naturally insinuating flower power. "Amoretum Vol. 1" is the first of a coupling—why not keep in theme, right?—upon which BLACK SPACE RIDERS gets groovy on top of loud. Not the 1960s connotation of groovy; the "120 Minutes" subtext is more apropos. Perhaps trying a stab at BAUHAUS or SONIC YOUTH might've worked some noteworthy magic, but instead we get "Come and Follow", boisterously mirroring the core riffs and mesmerized vocal sways of SIOUXSIE AND THE BANSHEES's "Monitor". "Soul Shelter" is a veritable collision between THE CURE's "Hanging Garden" and THE CULT. Even the vocals turn Astbury-esque as the cut changes tempo and volume. All that's missing from "Friends are Falling" being a full-fledged cover of U2's "Wire" is a harder tempo and Bono's soul-punching rips. Otherwise, the guitars free float in envious echoes of The Edge. These boldfaced tributes are too glaring, since the listener is busier linking comparisons than homing in on what's offered, which are familiarized setups to thriving guitar commencements. Positively, "Lovely Lovelie" opens the album with an addictive riff romp, though "Another Sort of Homecoming" afterwards rings as it says, presenting a reworking of past "Refugeeum" material with a hi-hat tapping disco swing. The eight minute-plus "Movements" delivers "Amoretum Vol. 1"'s most majestic passages after four minutes of wah-kissed funk as setup. At its peak, "Movements" is breathtaking. "Fire! Fire! (Death of a Giant)" and "Fellow Peacemakers" are both slow cookers requiring patience through their methodic progressions before the ripping payoffs come, particularly in the latter's case. If you really dismantle "Fellow Peacemakers", however, you'll detect systematic elements of U2's "Zooropa" planted all over it, from the electro scratches to the somber piano spools, all threaded in hipster fashion. The dancy buzz bombs of "Give Gravitation to the People" from "D:REI" is still the closest BLACK SPACE RIDERS has come to penetrating a wider market, and it's too bad it never became the cheeky rave rocker it was subtly aspiring to be. That being said, there's interest as to where the band is going on the second installment of its "Amoretum" experiment. Barring the band's occasional repetition of prior albums along with the blatant alternative shakes on this one, still, give BLACK SPACE RIDERS credit for surveying beyond its cosmic riff worship.